A key issue in developmental biology is the relationship between cell polarity and signal transduction pathways. Most eukaryotic cells are polarized and the control of this polarity in space and time is essential to coordinate changes in cell morphology with proliferation and morphogenetic movements required for the development of the organism. This control is carried out by signaling pathways that in turn are regulated in many cases by the subcellular localization of their components. In fact, there is a close relationship between polarity and the control of cell proliferation, since many receptors of intercellular communication pathways that regulate proliferation are located and activated in specific domains of the plasma membrane. A clear example of cell polarity is the apico-basal polarity of epithelial cells. This polarity is essential for the subcellular localization of adhesion and signaling proteins. 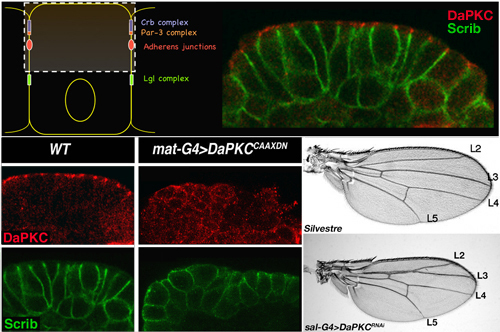 In the epithelium of vertebrates and Drosophila, several protein complexes associated with the membrane are required to establish cell polarity (Par-3/Par-6/aPKC and Crumbs/ Patj/Pals in apico-lateral and Dlg/Lgl/ Scribble in baso-lateral). Although for a long time the role of these complexes has been linked with epithelial polarity, it is increasingly clear that these proteins are also interacting and regulating signaling pathways. The interest of my group is to understand how cell polarity is established and maintained and also how this polarity can regulate signaling processes. Using biochemical and genetic approaches, we are currently looking for new proteins that interact or can be modulated by aPKC, one of the key elements in the establishment of epithelial polarity. Our main model organism is Drosophila melanogaster but we are using Xenopus laevis and Danio rerio to confirm the validity of our results in vertebrates.